So on Friday, being immobilized after the activities of Thursday night, I took it upon myself to not leave my bed all day. Good thing I have a TV in my room! Allison and I (see! I told you I had girl friends!) piled all of our pillows onto my bed and turned on the movie The Adventures of Tintin, which we got a few days ago from a Redbox (New favorite thing. Seriously. Movies for a dollar. Awesome.). 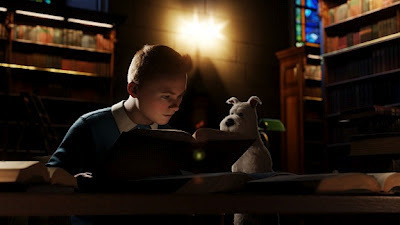 Now, I had wanted to see Tintin in theaters, partially because movies in general are always just better in theaters and partially because it looked like they had fit so much artistry into this film that seeing it on a small screen would really detract from the whole effect. Even after seeing it, I still feel like I would rather have watched it on a big screen, cuz, man, this movie is a real dazzler. 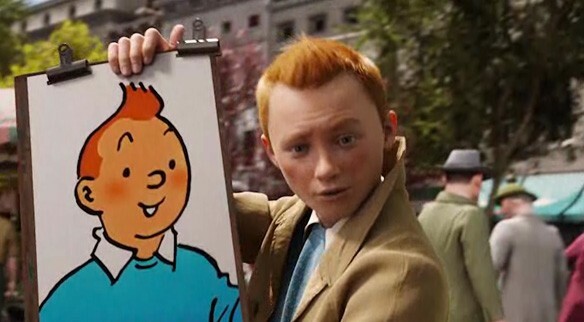 The plot revolves around Tintin (voiced by Jamie Bell), a journalist (though we never really see him writing anything) in his early 20's who is always solving mysteries, the adorable red-headed scamp. He also gets some help from his dog, Snowy. On the day that that film begins, he is at a small flea market and finds a model ship that he's extremely interested in buying. After haggling for about five seconds, he ends up getting the ship. 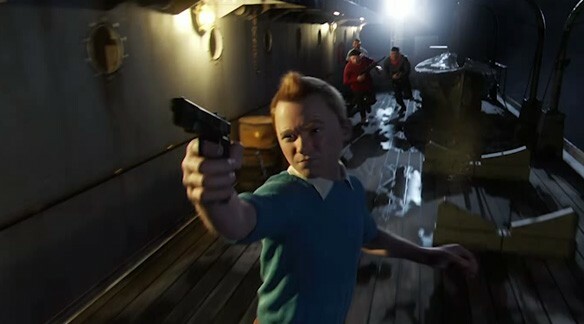 Literally two seconds after the old man sells him the thing, an American comes up to Tintin and pantingly warns him that he will be in grave danger if he doesn't get rid of the ship immediately. 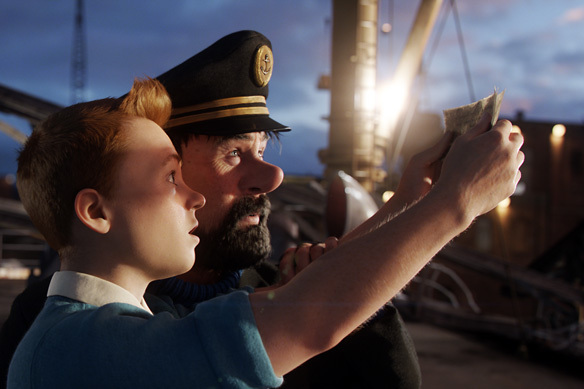 Tintin, like all adorable youngsters from the 40s, assures the man that he doesn't wanna get rid of the ship cuz, well, it's pretty awesome and probably worth any level of danger it might bring (you know a kid from today would dump that ship in the nearest trash can and run like hell). The American runs away and is then replaced by a man who claims to be a noble, and offers Tintin any price he wants for the model ship. Tintin again insists that it's not for sale and goes on his merry way. Later that day Tintin comes home to find his home ransacked and the ship stolen and decides to investigate the case of this mysterious ship. What investigating looked like before the internet, kids. Along this adventure he gets kidnapped, ends up abroad, crosses a desert, and even flies a plane, among a mass of cool chases and comical fighting scenes. He also encounters a sea captain with a rather intense drinking problem (who could be the answer to all of the model ships' mysteries), a pickpocket's side story and a story as old as a legend. Well first of all, this movie is beautifully crafted. Being set in Europe, Tin Tin captures all of the charm of the mid-20th century while simultaneously incorporating the essence of the cartoon and the wonder of faraway lands and legends. It's extremely nostalgic for Hollywood glamour and old timey pizazz without going over modern kids' heads. Second of all the characters are great. I was expecting Tintin to start getting on my nerves (seriously, boyish charm can morph very quickly into stupidity), but he's so balanced out by the hilarious Captain Haddock (voiced by Andy Serkis), that really both characters end up being pretty likeable. And Tintin's personality ends up having a bit of an edge to it at times that makes him more human than I really expected him to be. He gets a gun? Upgrade! Bottom line for this adventure is that I really loved it. It's simple storyline has that sort of Nancy Drew/Hardy Boys feel to it that a lot of movies today don't take more advantage of. It ended up being sort of a mixture of Indiana Jones and Sherlock type mystery. But a huuuuge part of why I loved it is also just the visual quality of the film itself. They really did not cut any corners in making sure the lighting, character movements, sets, and (a common problem in 3D movies) HAIR all looked incredibly realistic. Additionally, they did not compromise the fact that this film is based on the comic series, making the proportions of the characters faces comical and caricatured as they should be. 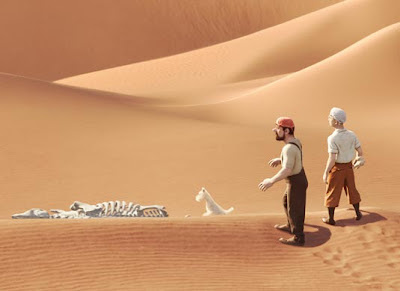 Somehow it all ended up working and the end result is a beautiful nostalgic children's film. Check it out!